Would you recommend &chill to a friend? Feels a bit like turntable.fm. RIP. @rrhoover Thanks Ryan! Hope you had fun and thanks for the playlist link! @rrhoover i got the exact same feeling about turntable. @edwardsansom congrats on building a really cool product. are you thinking about incorporating any features that will help with the live problem -- i.e., the experience is only as good as having people on it? public rooms is a one good solution to address it (which you've implemented). thinking of others? Is there an opportunity for a follow graph either at the user level, or maybe the video topic level? I could totally see wanting to watch, say, a ted talk or a programming tutorial at the same time others were watching and to opine or ask others questions (even if i didn't already know the people). @edwardsansom @robjama @cpollo01 Any plans to let room creators decorate/customise their rooms and interact with other viewers 1-2-1 (IM)? What other stuff is coming soon? @mattnavarra Hey Matt, yep totally. We worked with G2 Esports to create a room for the staff and fans to watch their team compete. Check out g2esports.andchill.tv. It was a one off concept but we got some really great feedback from it. At the moment people can voice chat to each other if they’re sitting in the same row and text chat to talk to anyone in the room. 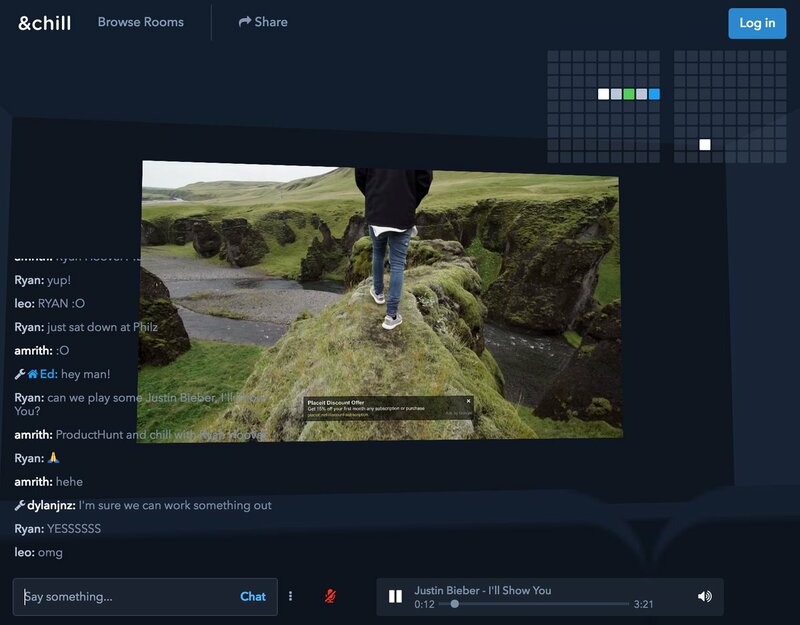 Expanding on this we think it’d be pretty cool to see what your friends are watching, so we’re looking to add some more social features for 1:1 interaction between people. We’re also looking into automating some of the content, as well as maybe opening up an API. Thanks! @edwardsansom nice work and there seems to be something here. What's the monetization strategy beyond advertising? Discovery is a huge issue facing YouTube and Twitch right now - love to see innovative approaches like this! @andythegiant I agree. Thanks Andy! Hey @edwardsansom &chill is really cool. here I just want to know that have you referred http://tympanus.net/codrops/2016... for UI help? @mhrnik Thanks mihir! Yep, we wrote a little something here. @bentossell Thanks Ben! We think that’s when it gets good. We had about 100+ gamers in a room at once and it was a lot of fun. What's a good communal synced video watching service yet? What's the best service to discover interesting YouTube channels?